Are you looking for a sincere human connection with someone who has the same interests as you? EHarmony is one of many dating websites online. Is it a great choice? In this brief but nonetheless detailed review we are going to enable you understand what eHarmony is about and if it worth your time, emotional investment and money. This is a premium dating website that is designed to help you connect with men and women looking for friendship, love or even serious relationships that can lead to long term commitment. According the information provided on the site anyone one can sign up whether you live in the United States or any part of the world. The site about description goes on to say that they are committed to helping users find their ideal/perfect woman or man. Within a couple of minutes you can sign up and start browsing profile of potential matches. Sure, without an upgrade you are able to browse through profiles of other users in the site. What you are not able to do is actually send messages to potential matches and be able to receive messages from them. One would argue that without upgrading your account you are not really taking advantage of what eHarmony has to offer. Like most other dating sites joining is completely free. In the case of eharmony.com, while simply joining is absolutely free, you are not allowed to use most of the features when using the free version. For instance, with the free version you can search and actually get matches. However, to communicate with the matches you must pay. Signing up to join enahrmony.com is pretty easy. 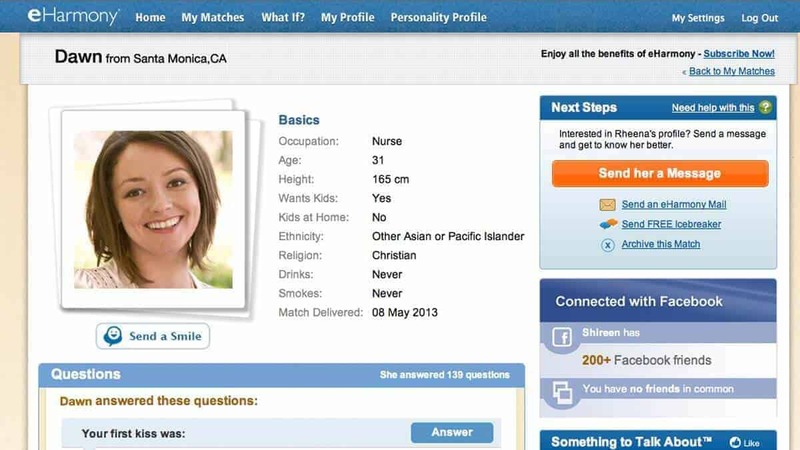 All it entails is to build a profile with your information to help create a profile that your possible matches will see. The personal details needed to create your profile include basics about your appearance such as hair colour, height, ethnicity and eye colour. You may also choose to share some other personal details such as occupation, personal likes and hobbies. The headline is simply a short and attractive description of yourself so you can get attention from plausible candidates. What is particularly impressive about eharmony.com is their detailed criteria section. It allows users to choose a specific factor they want in a potential match. This ranges from physical traits to religion and even nationality. Does this dating site Really Work? EHarmony has created a stellar reputation for creating a safe human environment where people can meet and make friendly or romantic connections. It is definitely worth trying out.